Billed with a Game of Thrones theme the talks the IBD recently put on by brewing professors David Quain and Charlie Bamforth didn't end with the violent death of either of them. Which all things considered is probably for the best. David Quain kicked off talking about draught beer quality. 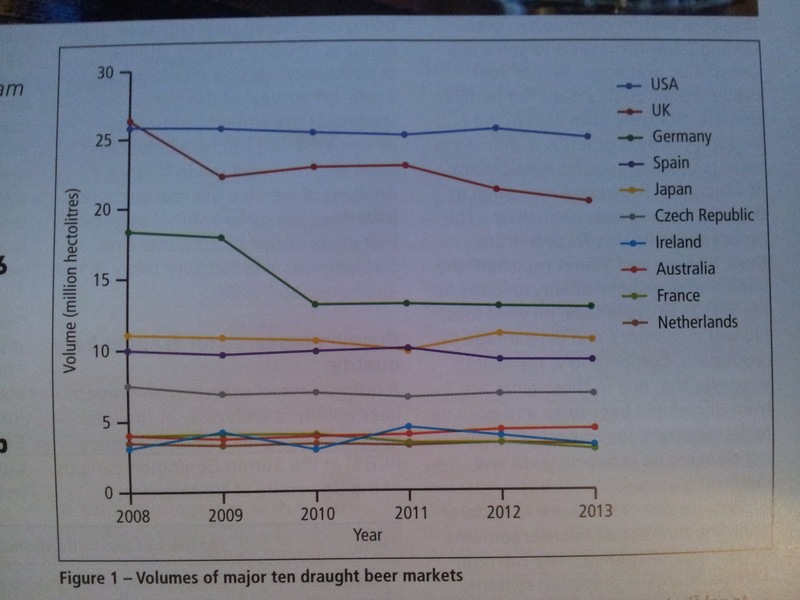 Though draught beer is a smaller market than small pack there is still a lot of draught beer sold and the UK is the world's second biggest producer of draught beer. Though draught beer sales in general are falling it was heartening to hear that lager is in decline and cask beer is showing some growth. The first problem are for draught beer quality was pythons, the chilled bundles of beer lines running from pub cellars to bars. They're often build into pubs so are many years old, and can be up to 120m in length, containing eight pints of beer! Many people mistakenly clean beer lines aggressively but in frequently, rather than less aggressively but more often. 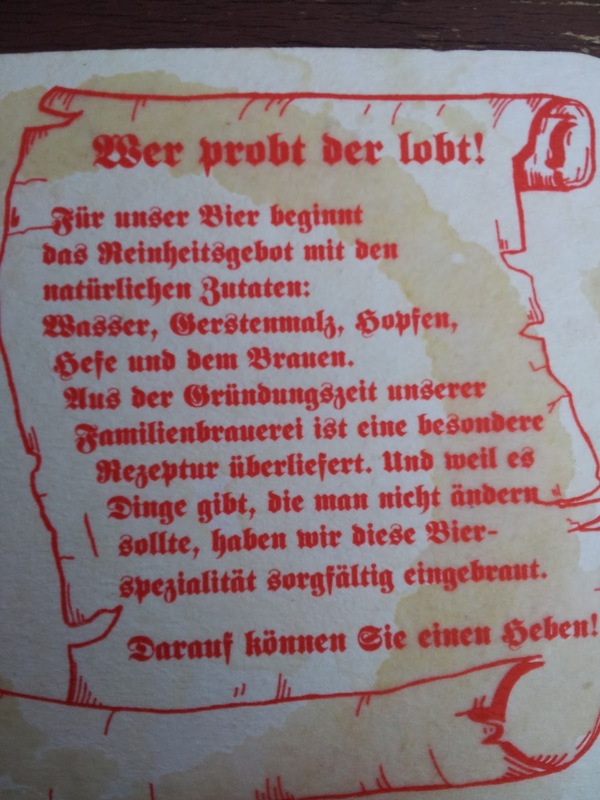 An old JIB paper, read at a meeting in 1911 chaired by Sydney O Neville, was quoted from at length to show how in many ways the same old problems with draught beer persist. 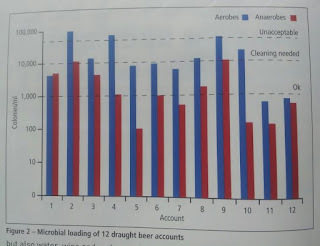 Though beer is microbiologically robust and pathogens won't grow in it sadly little attention if paid to beer hygiene. 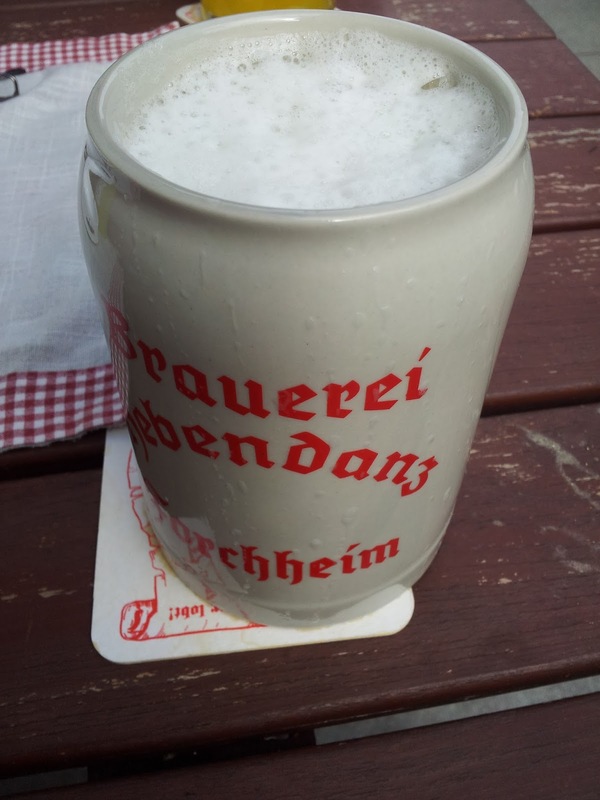 Worldwide there is only one set of draught beer standards: the German DIN. These say that less than 1,000 colony forming units/ml is good, 50,000 is unacceptable and 100,000 means need to line clean. Research in the on trade showed that these standards are not always reached. Weekly line cleaning is recommended but this is not always carried out. Line cleaning has little or no mechanical action, one of the key parts of cleaning and biofilms can build up in beer lines. Problems also arrise if pubs have too many beers on tap as the less popular beers will have beer sitting in the lines for ages. It has been shown that less line cleaning equals less profit for the pub. Hot spots for contamination are fob detectors and keg couplers in the cellar and nozzles and the bar. Nozzles are often removed at the end of the day and put in soda water. Strangely enough this isn't very good at killing bugs and line cleaner or sanitizing tablets work better. Charlie Bamforth was next and he didn't have any slides or a recent article in the IBD mag so there'll be less pictures. He said that beer quality is what makes customers come back and consistency is the most important thing. Each brand should always taste the same. 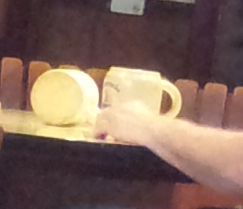 He had had problems in the improving a grainy tasting beer as customers were used to the off flavour! Quality is driven from the top and he once had a boss that said two things matter: quality and people. Look after the people and they'll look after the quality. Education is need to understand why things go wrong and Standard Operating Procedures are vital for consistency and making sure new staff can do the job. Everything needs to be documented and you need methodologies and measurements. The most important measurement though is taste, and you should taste everything. 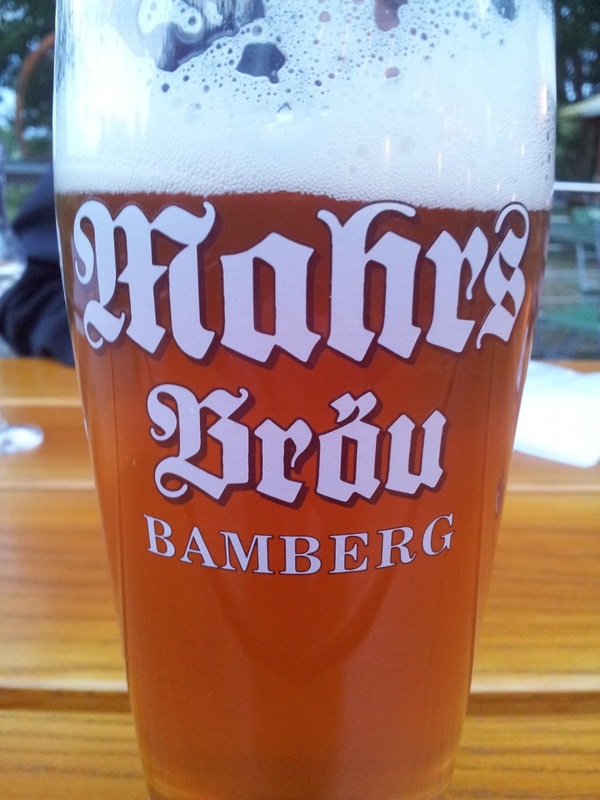 Pumping beer around a brewery can cause problems with CO2 and DO2 levels. Sparging with CO2 to correct them will cause foaming, some of which will solidify and need filtering out or it will leave the beer with bits in it. DO2 should be below 100ppb, some places have got it to below 50. 1. QA and analysis costs. 2. Internal failures which need correcting costs. 3. 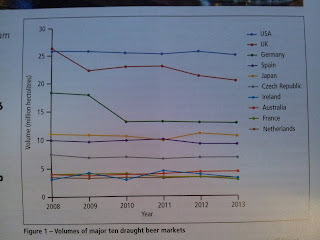 External failures: beer in trade problems. 4. QA invests money in making sure things go right first time. In spec. malt can still vary in taste: you need to specify how it's made not just the specs. The one book he recommended everyone should read is Sierra Nevada boss Ken Grossman's Beyond The Pale. 2. People need to learn brewing science. In the talk there were a lot more anecdotes, but I can't be arsed to type them all up. And anyway, with the Game of Thrones theme they should really have got Professor Graham Stewart down as his anecdotes had a much higher death rate. I'm sure most of them end with "of course he's dead now". We didn't stick around after the talks as rather unfortunately for somewhere that was hosting beer quality talks the beer quality at Ubrew wasn't very good, and the prices were outrageous. I don't know if it's now their normal prices or if they were doing some price gouging for the night but the cheapest beer was £7 a pint and prices went up considerably from there. Paying £7 to £9 a pint for halves of variable quality beer served in plastic skiffs is not something I'm keen on. My Summer holiday this year was in the Dolomites in Italy. 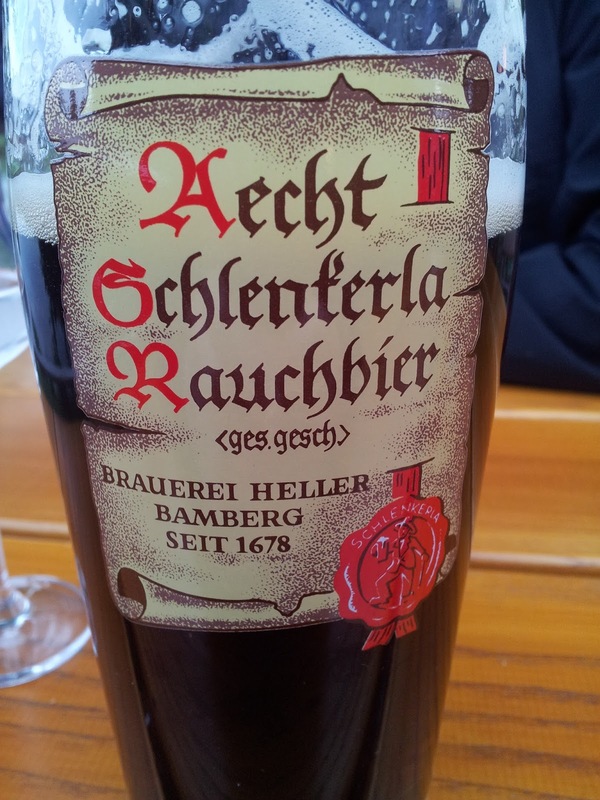 The area used to be part of Austria so the beer is generally Germanic, being pleasant enough but nothing to write home about. Whilst driving home through Bavaria it occurred to me that I might do rather better here. I remembered that I had Trips! (South) on my kindle so after a quick look the route was changed to go via Forchheim. According to the guide this town has three brewery taps in one street so it seemed an ideal place to visit. A friendly local and a handy map in the guide soon had us where we wanted and I was supping a beer from an earthenware mug I'm sure Orwell would have approved of. We sat outside Brauerei Hebendanz as it was dead inside. The beer was very good, and had the sort of drinkablility that's problematic when you still have important things to do, like find a campsite and put a tent up. The beer mat seemed to be extolling the virtues of the Beer Purity Law so I decided not to tell them how much they could improve their beer by adding cacao nibs. I'm sure some of my fellow beer geeks will soon do this vital task for me though. We wandered on a few doors to get to the next brewery tap but sadly soon realised it had closed. 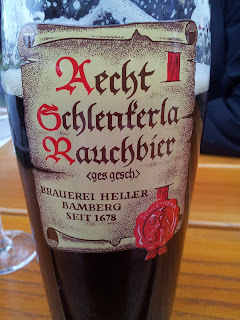 This meant we had to walk several doors back to get to Brauerei Neder. Unlike our last stop this place was packed, and had a very pub like feel. The one draught beer was served straight from the barrel, and when you wanted another you could simply lie your mug flat and another beer would be brought. 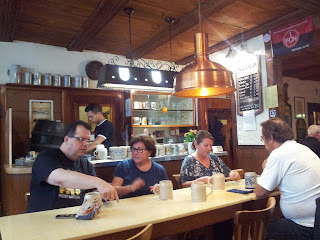 We loved it in here, and I was delighted to have finally found German lager that I liked. Unfiltered, unpasteurised and served without extraneous CO2 it got me wondering if the one true living beer breathes with two lungs. After all our mother church already, quite rightly, accepts that they have different brewing traditions over on the continent. I guess with lager the lower temperature of conditioning means there's enough CO2 that it doesn't need to secondary fermentation in the container from which it's served. I think the CAMRA technical committee needs to look into this and tell me if I was drinking real lager. Come on, I was in Bamburg, how could I not? *I was delighted to see when the left that the village had a hotel called Buger Hof. I organised a visit to the National Brewery Centre and the William Worthington Brewery for the Brewery History Society on Friday. We got shown the archives and I think it's fair to say that they have extensive files. There wasn't time to go into full geek mode but they have five rooms of stuff so there's a lot of nerdery potential. We walked through part of the museum to get to the breweries and I had the privilege of having people who'd worked with Burton unions explain to me how they operated. The beer would spend 36 hours in squares before going to the unions for 72 hours. The CO2 produced would force yeast and beer out of the swan necks and into the trough at the top. Beer would then run back into the 150 gallon barrels and when fermentation was finished the beer would be drawn for the bottom of the barrels. Bass had 60 sets in a union room, comprising of 1560 barrels. Then we saw the old five barrel brewery that came from Cape Hill. It's made of copper and clad with teak. It's not in use at the moment. And here's the Head Brewer Steve Wellington talking to us from the brewhouse. They're not currently making White Shield, but I did get to learn that the sticky yeast currently used for bottle conditioning originally came from Charrington's. And speaking of Charrington's they've revived Charrington IPA. This was the first IPA I ever drank and it was 3.9%, brown and sweet. The new version is based on an older recipe and is stronger and much more bitter. It was really good too, unlike the version I drank all those years ago. If you see it in the wild, don't miss out. I arrived in Amsterdam in time for the opening event at Oedipus Brewery. You have to take a short ferry ride from the Central Station to get there, but the ferry's free and frequent so it wasn't a problem. In many ways the Dutch are very civilised. The festival kicked off with a question and answer session with Chad Yakobson, of Crooked Stave and author of The Brettanomyces Project; Yvan De Baets, of Brasserie De La Senne, and Jean Van Roy of Cantillon. It was hosted by American beer importer Dan Shelton. Jean Van Roy talked of the remarkable turnaround that sour beer has had in the course of his brewing career. When he started Cantillon were brewing less than 500hl a year and he had to fight to sell any beer, now people are fighting to buy it! Since taking over as head brewer he has changed the production process slightly, in that barrels are now topped up so less beer is exposed to air and less acid is produced. He also talked about how they try to make the brewery as green as possible. As they can only brew when weather is too hot global warming has cut their brewing season by nearly two months a year since he started brewing. Chad Yakobson brews a range of beer using Brettanomyces, some sour and some not. The Brettanomyces Project came from work he did on the Masters degree course at Heriot-Watt. He's built up the cultures he brews with commercially over time and currently has two mixed cultures on the go. 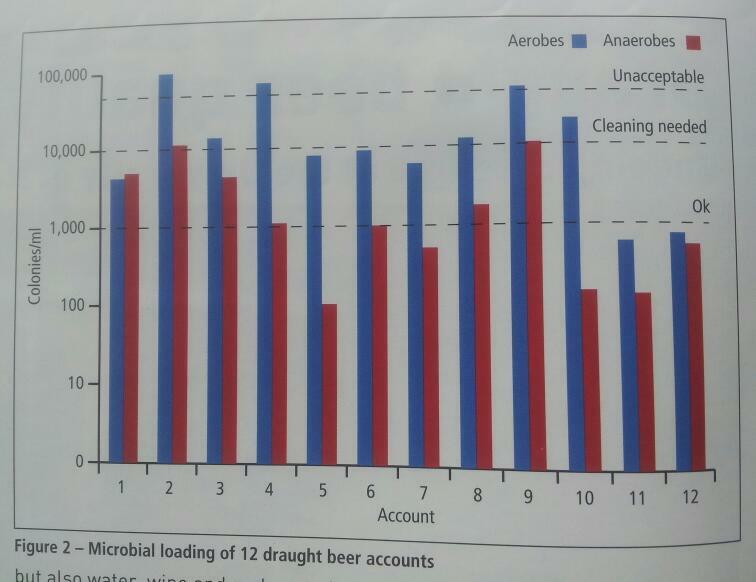 He also brews some 'clean' beers with Saccharomyces. Yvan De Baets brewed at Cantillon at one point, but when he started his own brewery only 5km didn't see the point of making sour beer himself. He has now started to use Brettanomyces, but adding complexity this way takes time. 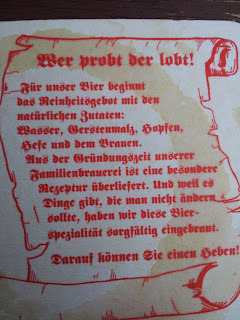 He mentioned that back in 1921 a Belgian brewing journal reported that cultured yeasts have simplified beer, and thinks that in the future people will look for local yeasts to add complexity. He's isolated a local strain of Brett. that he uses in a saison beer. All three of the speakers agreed that brewing combines science and art, each informing the other. My own talk on The Brewing Science of Brettanomyces was the next day, which I'll get round to writing up shortly. Though probably not before my next climbing trip. If anyone wants the slides drop me a line. The next speaker I saw was Pierre Tilquin, who founded his own Gueuze blending company Gueuzerie Tilquin. It's not a cheap things to do, as it cost €500,00 and production is currently 800hl a year. He buys in wort from Boon, Cantillon, Lindemans, and Giardin. He makes his gueuze by blending 50% one year old beer with 30% two year old and 20% three year old. He found some lambics age better than others; and some will attenuate to 100% apparent attenuation, whereas others will conk out at 75%. It was also interesting to hear that some lambic wort comes in at pH5 whereas others are at pH4. It confirms a point about lactic acid if you ask me, but Pierre was too diplomatic to say so. There were no more talks for me that day, as I'd met up with Geoff from Popes Yard brewery and was off sampling his excellent wares at In De Wilderman. I also got to touch Colin from Buxton brewery there. A slightly odd innovation for the Carnivale Brettanomyces was moving on from the common or garden 'meet the brewer' to 'touch the brewer'. Maybe it's an Amsterdam thing. Anyway, he didn't take offence when a stranger walked up and gratuitously touched him. The next morning Chad Yakobson was giving a talk which I couldn't miss. He talked about The Brettanomyces Project, Brettanomyces in general and Crooked Stave brewery. It was a comprehensive talk and I managed to add a few more fascinating facts to my Brettanomyces collection. Some of the alpha-glucosidase Brett. produces is extra-cellular, which explains the rise in glucose he found in some of his fermentations for The Brettanomyces Project. As he makes sour mixed culture, Brettanomyces, and 'clean' beers he has three separate colour coded sets of hoses, valves, pipes, packaging equipment and fermenters. After Chad's talk I hot footed it back to De Prael to see Ron on Stock Ales. His latest collaboration brew is a stock ale made with Goose Island, and there was a short introduction from their Innovation brewer. Ron followed by talking about the historic difference between mild ales and stock ales. They basically had the same recipe but stock ales had 50% more hops and were aged. Bass used to age their beer in barrels for a year, where they'd reach over 90% attenuation whereas many beers at the time had 75% or less. The Goose Island stock ale called 'Brewery Yard' was pitched with B.claussenii after primary fermentation and aged in barrels for 11 months. It had an OG of 1067 and an ABV of 7.3%. The IBUs were 95 before ageing and 62 after. We did get to try some, and it was reminiscent of McCrorie IPA. Then there was a home brewers event and I'd brought along a few bottles of various bretty beers I'd made, admittedly not all at home, to share out and Geoff was kind enough to share some of his Keeping Porter. After that I went to De Bierkoning to get some more of Eddie Gadd's gorgeous bretted IPA. I also blagged a T-shirt off one of the organisers, which was only fair said the judge. Then it was back to the wildeman where my higher functions slowly closed down over the course of the evening until it was time for my spinal cord to take me back to the hotel. That was it for me with the Brett. fest, though my flight wasn't till half one so I had time to take in some of the sights of Amsterdam before heading home.